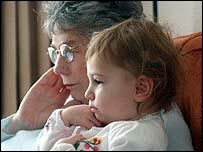 Modern grandmothers are in no mood to slow down and admit they are getting long in the tooth, research shows. A poll of 2,000 women by Yours magazine found they felt an average of 20 years younger than their real age. Most said they would not really feel truly old until they had reached their ninth decade, and led a busy, active life full of excitement. And almost all believed they were much more young at heart than their own grandmother. The respondents' average age was 69 but they said they felt more like 48. And with average life expectancy for a woman increasing, they can now expect to live longer than their predecessors. The poll found today's grandmothers were more likely to be travelling the world and enjoying regular nights out than opting for a quiet life sitting by the fire knitting. Many said they had never felt healthier, happier or financially more secure. On average, the women who took part in the study had two children - compared with the seven their own grandmothers brought up. Many respondents said they saw their grandchildren very regularly, with four out of 10 acting as child minders. However, there was a widespread feeling that there was more respect for older people in the 1960s, which the majority of respondents still viewed as a golden age of less crime and sleaze. Yours editor Valery McConnell said: "Retirement is now something to be relished not endured. "It is no longer the twilight years but the dawn of a whole new adventure. "Today's grans are having the time of their lives and the rest of us envy their carefree, groovy lifestyles. "This is the luckiest generation of grans ever. Many have good pensions, their homes have soared in value, they have good health and plenty of years to enjoy their new found leisure activities." Mel Beardon, Age Concern England spokeswomen said: "Many people haven't noticed that old age has been going through a silent revolution. "We now have pensioners who are exploring the world dating, working longer and enjoying an active social life. "However despite this older people still suffer ageist barriers once they turn 65. "Many are denied services, jobs and even medical treatment simply because of their age." My mother is 67 and is definitely a groovy gran. She is young in both mind and body. Her interests include swimming, mountain walking, line dancing and generally enjoying everyday of her life. I challenge any other gran of her years, to keep up with her pace. She is such an inspiration to the somewhat 'couch potato' culture evident in today's society. I am in my late 40's. I exercise every day. I have trouble getting people to believe I have two grown up children. I enjoy going out, dressing up. I work full-time and have more energy than most of the young people I work with. My mum is 55 and has 2 grandchildren aged 10 months and 4 years old - she is currently sailing her yacht round the Bahamas and has no intention of slowing down! I am 57 years old and I am a great gran. I have 9 grandchildren and 3 great grandchildren and love every single one. I enjoy walking the cliffs round our beautiful island with my husband. We love walking and having fun with our lovely family. I live life to the full and enjoy every minute. Groovy grannies? Secure finances? New lease of life? I don't know where you're getting your grannies from. Many of the elderly (70+) ladies I know have severe financial and medical worries. Ignored by the government, often neglected by their families and subjected to a total lack of mental or emotional provision and care or opportunities to develop themselves in old age. I suspect your 'groovy grannies' were well off and successful if they now have the opportunity to enjoy the sort of retirement you portray. I am only just 51 and have a grandaughter of nearly 2 and a grandson of 5 months. My mum was only 21 when she had me so when I had my children at 27 and 29, she was only just heading for 60 when than they were little. My mother is definitely a groovy granny! She is loving and affectionate with my sister's three kids. She plays all sorts of games and runs around the garden with them. Now in her 60's she has just moved to Costa Rica with my father. There she has travelled all around the country, taken up Spanish lessons, art classes, joined a cooking club and gardening club and has just come back from a 10 day holiday travelling around Nicaragua! I hope I will be a groovy gran like her one day! I am 60, but still feel inside like I am late 30's, and that feeling does reflect in your whole look and way of life. As a widow I have been looking at dating again, but have found men even 5-10 years younger than myself to be too old for me and dare I say fuddy-duddy. Oh, and I have 9 grandchildren who keep asking me when I am going to start growing up and behaving like a 'proper' gran. Ha! My sister and I were brought up from the age of 7 and 8 by my grandmother when she was 76! I am now 25 and have the coolest granny about. Ok she is a little stuck in her ways and can be very stubborn but now at the age of 89 she is taking flights, going on exotic holidays and even went on a camel trek last year in Morocco. I hope that I have inherited 1/2 of her zing. My stepmother is a groovy gran! She is only 43 and has a two year old grand-daughter. I am amazed that she still goes to nightclubs and has two jobs. In comparison, my nan is in her late 70's and claims to have never drunk a drop! Bring on old age! I'm a 62 year young grandmother with grandchildren of 16 and 18. I am a member of SKI and have a ball. Feeling old? I don't think so.